......Away From The Things Of Man: Home from OKC! I returned home today from a business trip to Oklahoma City. If you're a regular reader of this blog, you know how much I love my trips to OKC. You also know that I love smashing bricks on my left foot over and over again. Meaning I don't really enjoy my trips to OKC. This has nothing to do with the wonderfully nice people who live there and everything to do with geography. Oklahoma is one of the flattest and least interesting states, in my opinion, located in the almost exact center of our great country, where the wind comes sweepin' down the plain, and twisters, and HOT weather that makes you feel miserable in the Summer, and is as far from everything as it is close. It's just not the type of place that appeals to me in any way. Plus, these trips totally disrupt my personal and family life. I don't like leaving my beautiful daughter behind. And I actually have to work when I'm out there. So I came home today. Leave it to my management staff to make this trip at least a little worthwhile. While it was depressingly hot in OKC, we had a great and unique opportunity to gather together all 60 members of the management team of our newly reorganized organization, which actually was pretty cool, but it was my own management team who made our time after hours so much fun. So a big shoutout to Nate, Langston, and Jim for making it at least somewhat tolerable to be away from home. And that's an understatement. Among some of our fun social activities was a trip to see the minor league baseball Oklahoma City Dodgers play and win at their beautiful ballpark in Bricktown. Staying in Bricktown, a cool, trendy, touristy area of restaurants and sites in OKC, was a lot more fun than the usual suburban hotels I normally stay in. Our boss also organized an 80s Night at the local rollerskating rink. While I didn't skate, I did show up in my best Magnum PI Hawaiian shirt, and I even shaved off my goatee to add to the illusion. 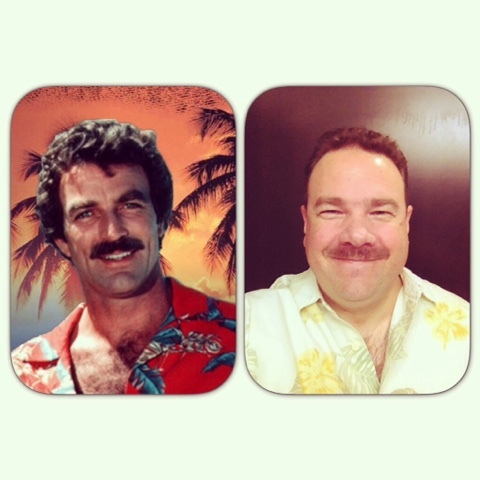 I'm not delusional, however...I know I look nothing like Tom Selleck, but I attempted to look the part. It was a fun evening. I'll have a lot more to talk about, but right now I'm a little jet lagged and I'm going to bed. Have a great evening, everyone! Where In The World Is Eric?! ?